Rate this Article With the continual increase in popularity of VR applications especially in computer games, Virtual Reality has once again found its way into the Arcade game industry. With the continual increase in popularity of VR applications especially in computer games, Virtual Reality has once again found its way into the Arcade game industry. The regular coin-op machines running Mortal Combat or Street Fighter may still be around for some time to come but the attraction of VR as a unique new form of entertainment medium which will draw crowds of curious onlookers and potential players has spawned a new wave of Arcade outlets that cater to this form of gaming. In the 80’s and 90’s, the emergence of gaming centers where players engaged in active shoot-outs in an assigned area or arena, with obstacles placed in strategic locations providing player cover became very popular. This was called Lazer Tag where players shot at each other with electronic weapons that shot out an optical laser to be received by an equivalent receptor vest. This way, one knew when one was hit by the other. Today, the arcade seems to be bringing Lazer Tag back, only in a different way. VR arcades are starting to appear in the traditional venues where Lazer Tag used to be. The idea is to have a gaming arena (somewhat the size of a spacious warehouse around several thousand square meters) where several players wearing VR headsets and armed with VR props can run around and interact with each other in a simulated VR environment like a multiplayer FPS. VRcade is one such company who is spearheading the effort to promote this kind of gaming environment. They recently launched their VRcade system in partnership with Dave & Buster, a popular restaurant and entertainment center chain in the US with several branches nationwide. Starting with their Milpitas CA branch, Dave and Buster intends to add the VRcade arena feature for their customers. VRcade uses a deployable turnkey proprietary system where all the VR equipment from the control unit, the headset, clamps, and other devices to the alcohol wipes are provided as a single package. The headsets are custom made and currently use a 5.9 inch screen at 1280×800. The lenses are mounted in such a way that they have a universal fit with no need for dioptic or IPD adjustments. This has worked so far for almost everyone who has used them. The headsets are also self-contained without the need for wiring or a back pack of any kind. It can receive wireless video and audio streaming and get its power from a small integrated battery. Tracking is accomplished via an overhead camera array that uses reflective fiduciary markers embedded on both the HMD (headset) and props (guns). VRcade was launched with 2 available FPS games. Time Zombies an FPS Zombie shooter custom developed by their software division VRStudios and Interstellar Marines Bullseye developed by Zero Point Softwares and adapted from their VR title Interstellar Marines. The company is currently inviting developers for the VIVE VR and the Oculus to adapt their VR titles to the system and develop new ones for it and take advantage of the large space available for the player to move around, something not possible in a home based room scale configured VR system as the Vive and Rift are. Also, VRcade utilizes an in-game chaperon system for the safety of the user who cannot actually see the real surroundings despite the adequate space. A voice will warn and instruct the gamer if the physical area parameters have been breached. Even the height and size of the player are tracked by the system that adjusts the game play’s point-of-view accordingly. Despite its overwhelming-crowd drawing successful launch, the VRcade system still has several challenges to overcome. Things like the sturdiness and reliability of the equipment, the maintenance and the troubleshooting of real-time problems, the customer service throughput (serving customers as efficiently and effectively as not to waste time) and the hygienic issues that affect the system. It is public so a sweaty face or palm can end up sliming the next user. Game play wise, the system currently uses simple game interface. Point and shoot the Zombie. However, plans have been made to develop games that have user friendly albeit fast paced and complex controls (drop down menus for alternate weapons fire and the like). As for future plans and objectives, VRcade is targeting the E-sports gaming industry by creating VR E-sport centers where players can engage in E-sport events with the freedom to run around and compete with or shoot each other. Just like a Lazer Tag match happening in Virtual Reality, players in VR headsets run about, crouch, shoot, jump and pick up objects all over the designated large area while battling it out in Virtual Reality. This will also create a VR home – VRcade synergy where players can practice the VR game at home with a room scale version then duke it out in a real VR tournament at the VR arcade center. Micro Transactions and sales will also be interlinked for an integrated business model for both VR home and VRcade. 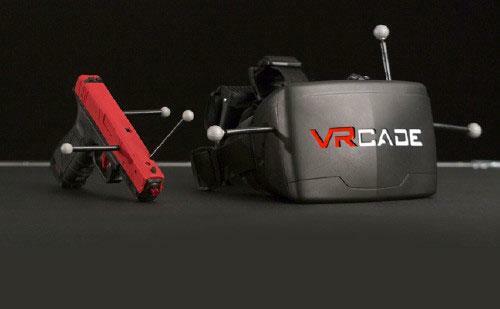 For a price of $5 (USD) for 5 minutes, VRcade offers a pretty good deal for experiencing VR while being able to run around a 225 square foot space, especially for those who have never experienced VR or are just plain curious. So, if you happen to be one of the above, do get in line and seize a chance to give it a try. It’ll be very much worth it, that’s for sure!